The World Bank's team ended Tuesday the talks over the new project for assisting the energy sector development. The project of $25 million is aimed at improving the Macedonian energy system and ultimately strengthening the electricity supply, reducing costs and raising security. Vojo Mihajlovski, former director of the Health Fund, tried to kill himself last night, VMRO-NP president Vesna Janevska reported. INFOMAC Daily News Service - The Macedonian police cut on Tuesday organized channel for trafficking in people and stolen vehicles. Nine persons including two policemen from the Bogorodica border crossing have been detained, as arrest warrants have been issued for another two. Foreign Minister Ilinka Mitreva is launching on Thursday (November 17) her diplomatic tour of the EU member states. Paris will be her first stop where she is set to meet the Secretary General of the International Francophone Organization and the French Minister for the Francophone Community. She is also scheduled to open the exhibition "150 Years of French Diplomatic Presence in Skopje and Bitola" in the Macedonian Embassy in Paris. The State Anti-Corruption Commission appealed today for greater cooperation by all the state institutions as well as for support from the Macedonian Parliament and Government for efficient implementation of the European Commission's recommendations. Osman Ferdi, protégé of the Skopje Institute for Rehabilitation of Children and Youth, is Macedonia's representative for the European Songfest, a European music festival for persons with intellectual disabilities. The Government projected next year's tax revenues to exceed those of 2005 by 3.5 billion denars, or 6.6 percent, as a result of the higher growth rate, which is projected at 4 percent in 2006, and of the better tax collection by the Internal Revenue Service and the other bodies. In addition, the fiscal and monetary discipline, keeping salaries under control and maintaining a fiscal deficit of 0.6 percent of GDP will continue. This has been agreed between the Macedonian negotiating team and the IMF mission over the past few days. Kosovo's southern neighbor, Macedonia, has a significant ethnic Albanian population, Nicholas Burns, US under secretary of state for political affairs, said in a news conference in Washington November 8, Bureau of IIP, US Department of State reports. Starting from November, a Macedonian Army (ARM) unit will participate in a humanitarian operation organized by a number of countries offering help to the Pakistani citizens who suffered in the Pakistani earthquake. This operation is within the frames of the NATO mission. "Today we received the answer to the question whether Macedonia will be a member of the European Union. The answer is yes," Macedonian Prime Minister Vlado Buckovski said in today's address to the nation following the European Commission's positive assessment for Macedonia's candidature for EU membership. EU Special Representative and EC Ambassador to Macedonia Erwan Fouere said in Skopje today that the European Commission's positive opinion on Macedonia's membership application opened a new stage in Macedonia's relations with the EU and represented an important political message, recognizing the efforts of the country to overcome past divisions and the Government's great progress in conducting reforms. EC Enlargement Commissioner Olli Rehn recommended today a candidate status for Macedonia. of the Council of the EU. Dublin, Ireland, March 22nd, 2004. 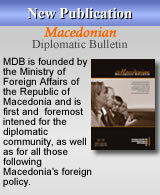 The Republic of Macedonia presented its application for membership in the European Union on March 22, 2004. The application is a result of a continuous process of rapprochement to the European Union since the independence of the country in 1991. The course of European integration has been supported all along by all relevant political actors in the country and largely by the population. "From the start the Government stated its plans and the deadline. We said that we expect to receive the status candidate for EU membership in December, and that the date for the negotiations and the negotiations themselves would come in some subsequent phase. I think that it would be very good if on 9 November it is confirmed that Macedonia's plans were right, that the country set itself a deadline and that it observed this deadline," Deputy Prime Minister Radmila Sekerinska said in an interview for A1 Television. Erwan Fouere, new representative of the European Commission to Macedonia, stated at today's regional conference on Conflict Prevention Through Integration that Macedonia is a European success story in which the period of consolidation has been completed. Fouere believes that the forthcoming period will be a time for serious and thorough reforms in Macedonia. It was the Newcastle disease that caused the death of poultry in Macedonia, as evidenced by the analysis of the Mogila hen samples carried out in the Weybridge laboratory in England. Interior Minister Ljubomir Mihajlovski claims that the security situation in Macedonia is good and that the latest bomb attacks in Prilep and Tetovo do not violate the country's security. Veterinary Office director Sloboden Cokrevski stated at today's press conference that, according to the preliminary results from the Weybridge laboratory, the bird flu virus was not found in the sample from Macedonia. Cokrevski stressed that the tests would last a few more days and that this is not 100 percent confirmation that there is no virus in the sample from Macedonia. The Anti Money Laundering Office uncovered 15 cases of money laundering and financing of terrorism. Vladimir Naumovski, director of the Anti Money Laundering Office, told Kanal 5 that these cases were sent to the Interior Ministry and Public Prosecutor, which are supposed to decide whether and when an investigation will be raised. The Ministry of Foreign Affairs of the Republic of Macedonia supports the statements of the United Nations Security Council of October 28, 2005 and of the informal summit of the European Union in London on October 27, 2005 condemning the statement of the President of the Islamic Republic of Iran, Mahmoud Ahmadinejad, in which he called for annulment of the state of Israel. "Compared with last year, when we had 1,500 open complaints to the ombudsman, so far this year we have received 2,200 complaints, which means that the citizens' complaints to the ombudsman have increased by 40 percent," Ombudsman Ixhet Memeti said in the interview for Radio Free Europe. Over 90 percent of the Macedonian citizens want their country to join the European Union, as evidenced by the opinion poll conducted by the Institute for Sociological, Political and Legal Research. The poll, carried out as part of the campaign "Mention Macedonia for the Good", is based on a sample of 1,200 citizens of the Republic of Macedonia. 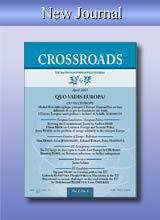 "Macedonia is prepared to be a constructive player in the big game on the final status of Kosovo. We have already sent positive signals about this from Skopje to Pristina and Belgrade," Prime Minister Vlado Buckovski said at the Washington Heritage Foundation, Voice of America reports. 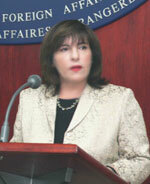 "The United States has an interest in closing the open issues in the region. They also have an interest in stabilizing the region and seeing that it becomes part of the EU and NATO integrations," Macedonian Ambassador to Washington Nikola Dimitrov said in an interview for BBC. Macedonia expects its strategic partner the United States to continue to actively support the country's integration processes. "The international community should apologize to Macedonia because the country was admitted to the UN under the provisional name of FYROM, resented by its citizens," Henryk Sokalski, the first special representative of the UN Secretary General to Macedonia, said in Skopje today. "It would be very good for the name dispute with Greece to be resolved, considering that this issue is using up a lot of diplomatic energy that could be used on other issues," British Ambassador to Macedonia Robert Chatterton Dickson said in the interview for Radio Free Europe. Prime Minister Vlado Buckovski and Foreign Minister Ilinka Mitreva will discuss Kosovo's future status and Macedonia's position on this issue with US Secretary of State Condoleezza Rice today. They are also expected to discuss UN mediator Mathew Nimetz's latest proposal for the resolving of the name dispute, which Greece rejected vigorously. The Court in Strasbourg ruled that the human rights of Macedonians in Greece, members of Vinozito, have been violated. The Court also ruled that Bulgaria violated the rights of the Macedonians in the parties OMO Ilinded and OMO Ilinden-Pirin. "The merging of the two EU missions in Macedonia is a positive gesture toward the country, and it is confirmation of the country's post-crisis normalization and its European perspectives," outgoing EU Representative to Macedonia Michael Sahlin told "Vreme".